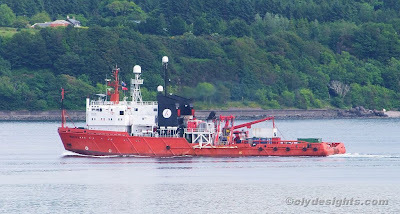 This powerful looking vessel arrived on the Clyde on Tuesday afternoon from Killybegs, in Ireland. MANTA III is owned by Allseas, operators of the pipe-laying ship SOLITAIRE which spent several weeks last autumn lying off the north end of Great Cumbrae. MANTA III was launched as NEFTEGAZ-73 in 1991 by Stocznia Szczecinska in Poland, but completed as PETEKA SUPPLY II. In 1995 she was reportedly converted to become a cable-layer, and after further modifications, she became MANTA in 2000. Five years later, she took her present name. MANTA III is 82.4 metres in length, and is some 1,397 tonnes deadweight. She was heading upriver to Shieldhall. Press reports suggest that resumption of the laying of the pipeline off the west coast of Ireland may be imminent, which may be connected with the visit by MANTA III to Glasgow.